As I prepare my presentation on the media assault on Israel’s legitimacy, at the Big Tent for Israel Conference in Manchester tomorrow, the following passages from a report on the kangaroo court known as The Russell Tribunal on Palestine, by NGO Monitor, are just priceless. During the proceedings, these individuals demonized Israel and denied Jewish self-determination. Israeli MK Haneen Zoabi declared that “I would say, there was no justification for Zionist projects and to have a Jewish state in my homeland. A series of op-eds and editorials attacked the Tribunal: Russell Tribunal a ‘kangaroo court’ (Times Online, Nov. 7, 2011); Lurid political theatre (The Citizen, Nov. 7, 2011);Demonisation and provocation (Business Day, Nov. 7, 2011), The Russell Tribunal onPalestine dishonours victims of apartheid (Mail & Guardian, Nov. 4, 2011); Lies told about Israel are beyond belief ([South Africa’s] Mail & Guardian, October 30, 2011). This PR stunt was a total failure; none of its stated objectives was achieved. The RToP failed to garner positive international media attention other than a single opinion piece placed in the Guardian [here]…and coverage in Al-Jazeera. To be fair, the RToP website cited another “news source”, under the section on favorable press in the UK, in addition to the Guardian: PressTV, the state controlled propaganda tool of the Islamic Republic of Iran. Who needs satirical take-downs of the institutional anti-Zionist bias of “the world’s leading liberal voice” when they seem all too eager to devolve into such (evidently unintentional) self-parody? Having just been in SA, I can confidently say that the Tribunal turned out to be a non-event locally. Very low reporting, mostly it was regarded as a waste of time and a joke by those few who even knew it was taking place. Kasrils is in trouble locally as well, under attack from some of his former comrades. South Africa’s rulers just proposed a Protection of Information Bill [POIB] designed to protect the ANC from criticism by declaring that reporting on matters that they decide may damage the country’s interests (i.e., the interests of ANC oligarchs) is illegal. It still has to be ratified by the provinces and is under challenge as unconstitutional. The bill is intended to protect an ANC apparatchik from prosecution for huge off-shore payoffs his wife received in exchange for tilting an arms deal to France. Like the Europeans with their huge financial problems, the South Africans are starting to realize that Israel is not their biggest problem, and the Palestinians not their biggest concern. A letter to the local paper estimated that 450,000 houses still need to be built near Cape Town to house the millions living in tin huts at Khayelitsha, considered the largest shanty town in Africa (http://kevinboswell.files.wordpress.com/2010/03/khayelitsha_1.jpg ). 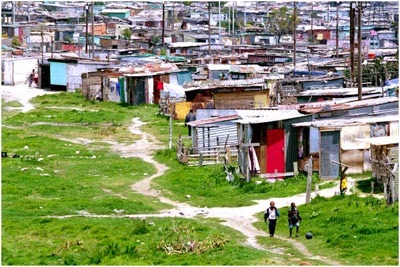 Gaza is a Paradise compared to Khayelitsha and, hard to believe, even worse slums that can be seen further away from cape Town along the N2 highway. At least a few in Khayelitsha have electricity. What other group has the UN bowing and scraping and showering money on the sacred palestinian cows for these last 60 years…..
Why is this still going on,the people of Gaza and the PA are being paid by the UN not to work,instead these people spend all day in coffee shops playing backgammon and smoking hasheesh……….. I always have the same initial response – “unbelievable” – immediately followed by “no – completely believable”. The Guardian has no moral or political compass any more other than scraping and bowing to Islam. The first response has about 474 recommendations for pointing out how egregious this article is. And how foolish. The Racist Anti-Semitic-Israeli-Zionist Guardian rag has chosen the wrong turn by backing radical Islam and the palestinians.now it’s backfiring on them……. They keep digging themselves into this huge big hole,and I wish them happy digging……. You just have to read the responses to their articles to see in which direction the wind is blowing. When you have this pathetic lame clueless twit called Berchmans defending the Guardian then you know that most of their posters have deserted them. Thanks to CifWatch the Guardian is hurting bad……. When you encounter those who have accepted as a poetic truth , the Narrative of Perpetual Palestinian Victimhood, facts, logic and reason are useless. See Shelby Steele, Gatestone blog archive, Narrative etc..